Inclinometer standards codified in the AMA Guide to the Evaluation of Permanent Impairment, third edition. Place inclinometer near joint to be measured; turn dial until scale reads 0; take joint through it's range; read range traveled directly from dial. 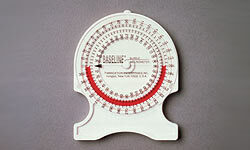 The Baseline AcuAngle inclinometer provides a pointer which is dampened by fluid to assure accurate ROM measurements. Place inclinometer near joint to be measured, turn the dial to zero, take joint through its range, and read range-of-motion from the dial. The adjustable feet along side-to-side scale adapts to body contours. Range-of-motion can be read directly after the joint has been taken through its range. 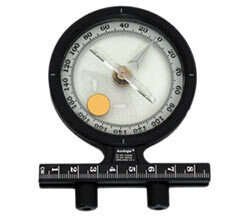 Place inclinometer near the joint to be measured; press "zero" button; move joint through its range; press "hold" button. Comes with case. Dimensions: Length 6", Width 1.25", Height 2". 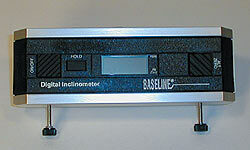 The Baseline Digital Inclinometer has a range of 360 degrees (-180 degrees to 180 degrees). The resolution is 1 degree ±1 degree. Inclinometer standards codified in the AMA Guide to the Evaluation of Permanent Impairment, third edition. Place inclinometer near joint to be measured; turn dial until scale reads 0; set first tab, take joint through its range; set second tab, read range traveled directly from dial. Measures range-of-motion of any body part. Set the moveable dial so that the weighted indicator points to zero move joint through its range and read dial. Accurately measures range-of-motion. Place inclinometer near the joint to be measured; turn the dial to zero; take the joint through its range; read the total range directly from the dial. Numerous measurements require the simultaneous use of 2 inclinometers. Comes in carry case. 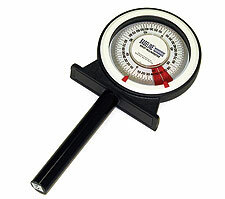 The Baseline Gravity Inclinometer has a range of 360 degrees. The resolution is 1 degree ±1 degree.